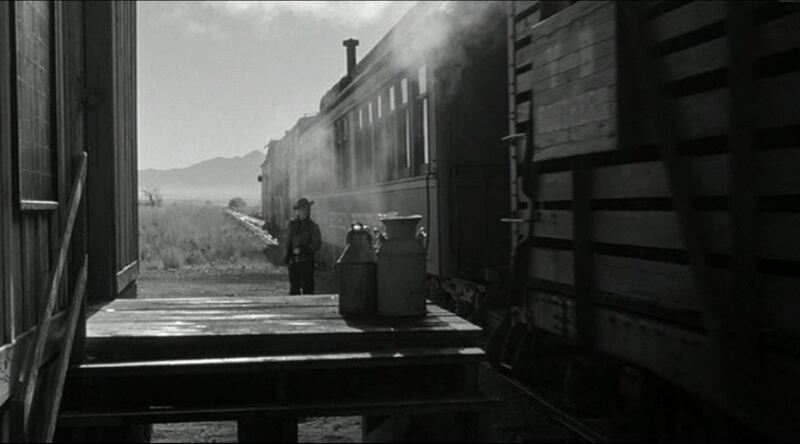 Not as well known as 1952’s High Noon, 3:10 to Yuma features a Southern Pacific Railroad Class M-4 Alco 2-6-0 steam engine and train. 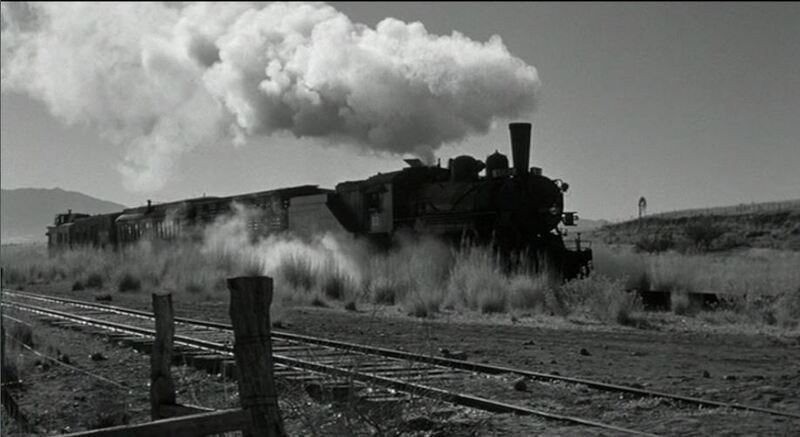 Filming of the railroad scenes during the movie’s exciting climax occurred in and around little Elgin, Arizona on Espee’s former Patagonia branch — long since abandoned. 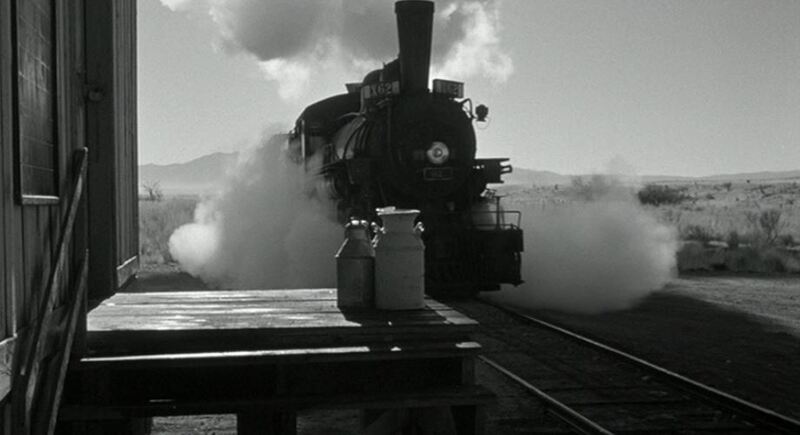 From what I’ve researched about this film, no one seems to know for sure exactly WHICH SP 2-6-0 was used. 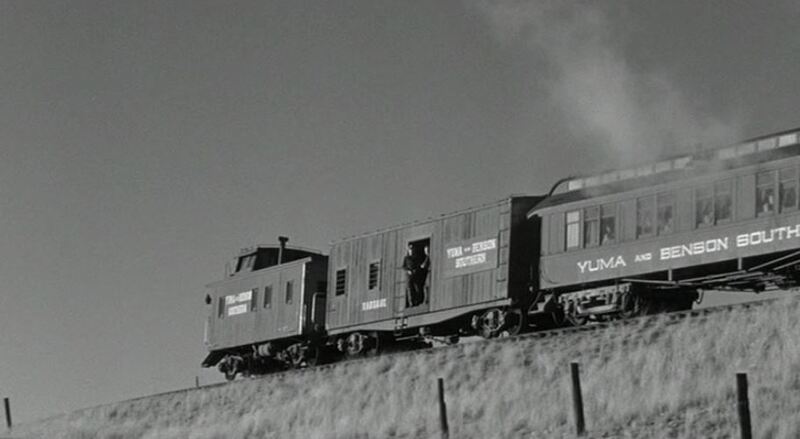 In the picture, the engine is lettered as X62 for the “Yuma and Benson Southern Railroad”, as is the rest of the train (stock car, coach, baggage car, caboose). 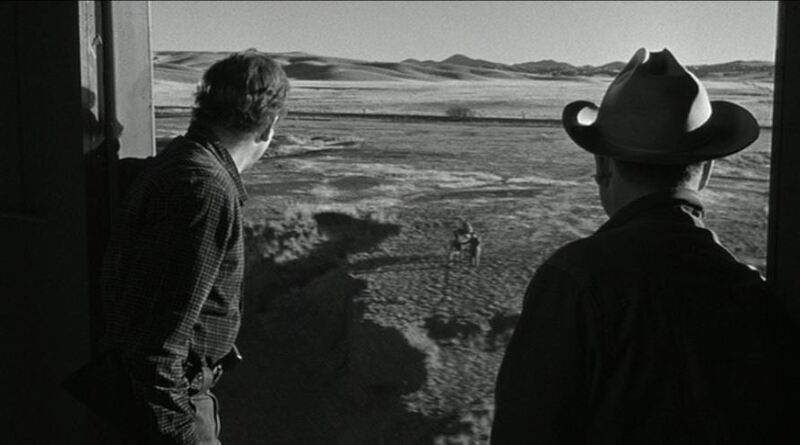 Despite having less than 5 minutes of screen time, the Espee consist highlights the climax and resolution of the movie’s conflict. Y&BS X62 trundles into town wreathed in steam. 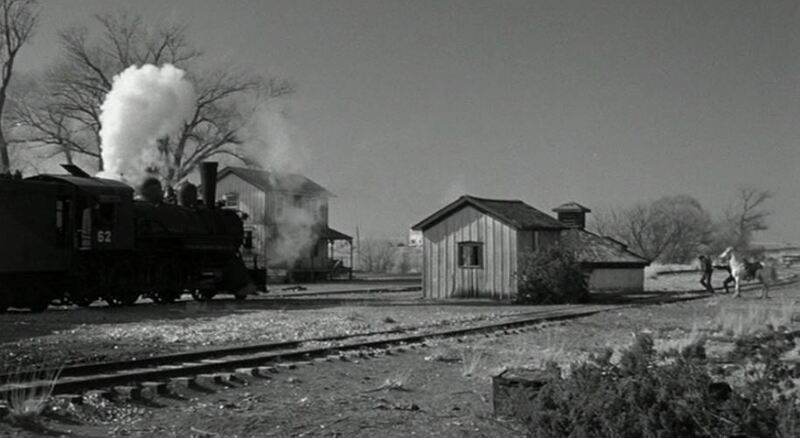 The entire train can be seen in this shot as it pulls into fictitious “Contention City”, Arizona. Merriam-Webster.com defines contentious as, “exhibiting an often perverse and wearisome tendency to quarrels and disputes”. 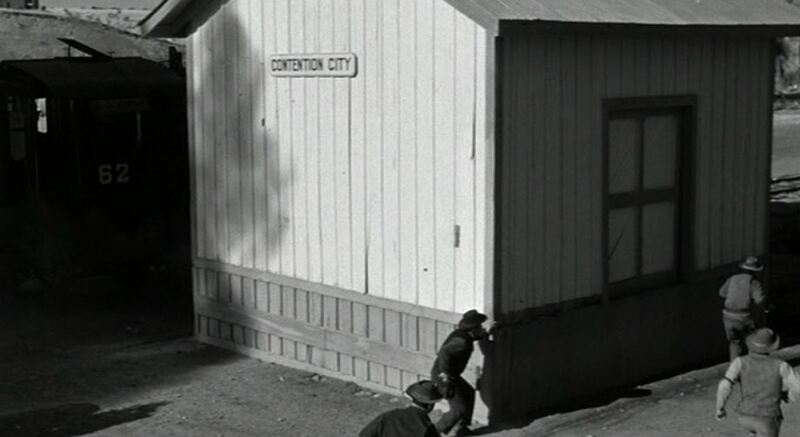 A questionable thing to name your town after, but certainly appropriate to the film’s plot. Extra 62 West is literally crawling through the weeds as it steams into town; A good head-on view of the locomotive with its SP-style number boards. I love that funky smokestack! 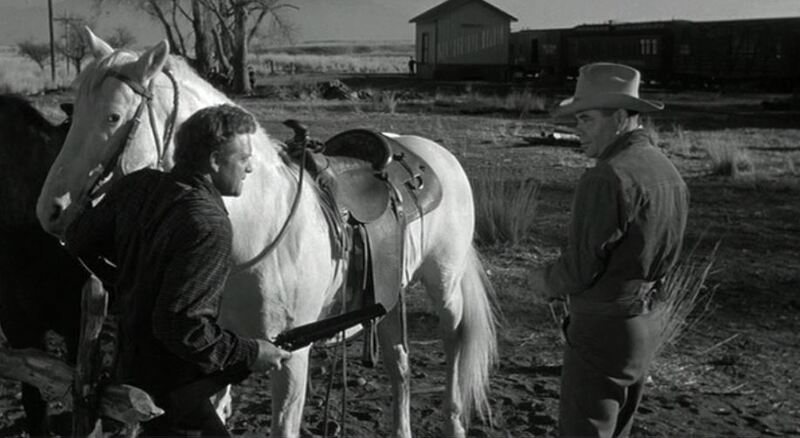 A shotgun-toting Dan Evans (played by Van Heflin) is tasked with putting bad guy, Ben Wade (played by Glenn Ford) on this train to face justice in far away Yuma, Arizona. Wade’s gang is trying to prevent it. 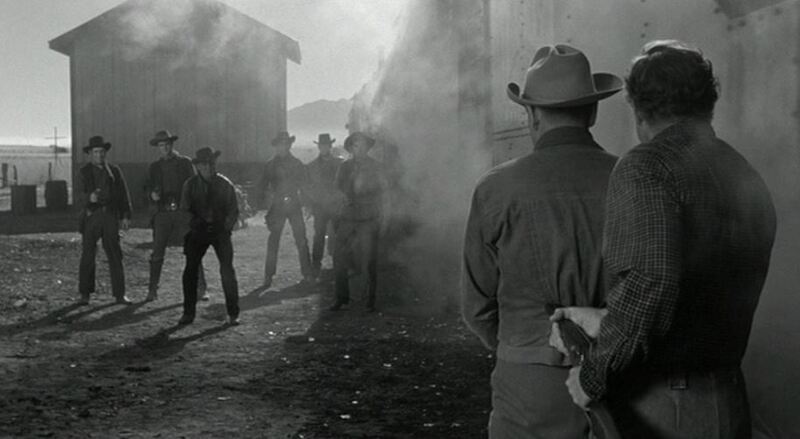 Using a small, lineside building as cover, Wade’s gang sets up alongside the arriving train. 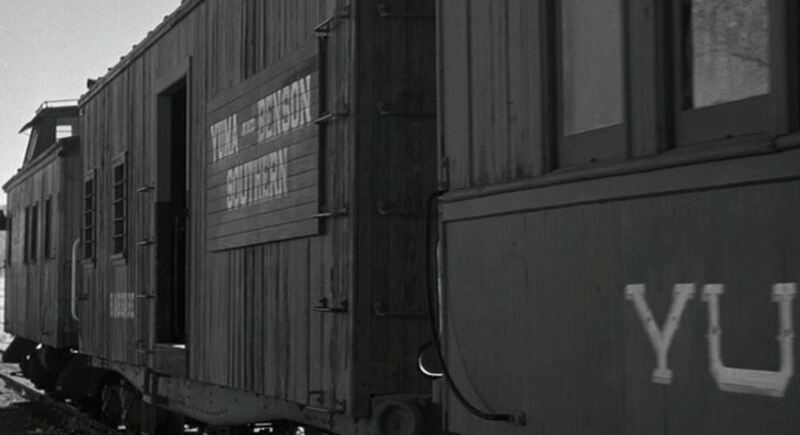 Another view of the train – note the Y&B Southern-labeled stock car and coach. 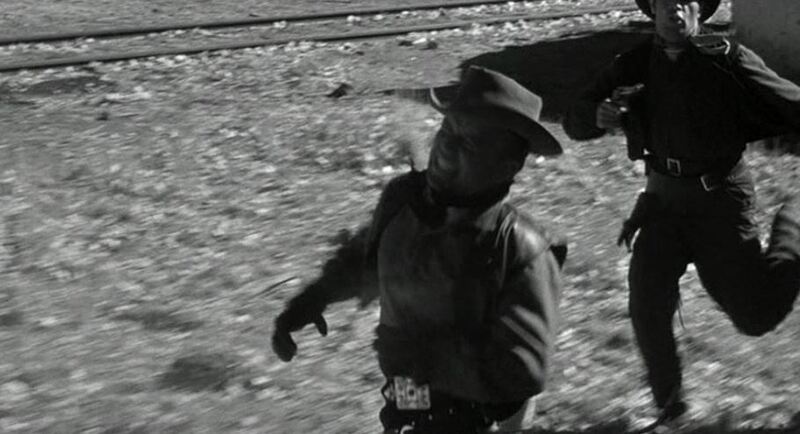 Nice view of X62 whistling off as Evans uses a horse as cover; Evans hustles the handcuffed Wade towards the train. 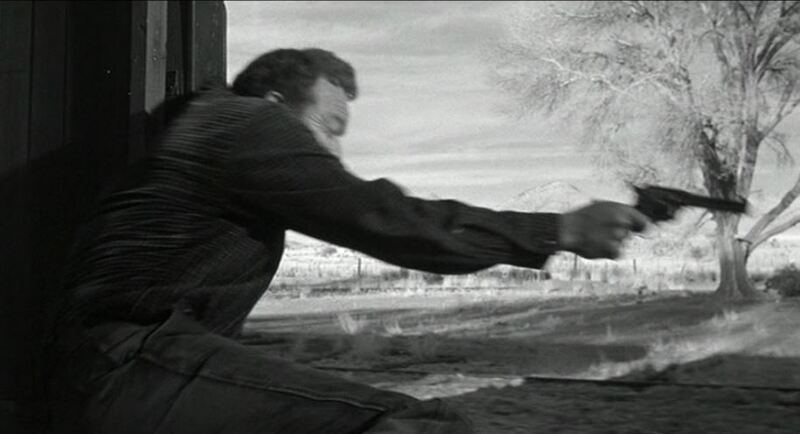 Surrogate gang leader Charlie Prince (played by Richard Jaeckel) has a perfect shot down the platform as the conductor waves a highball. 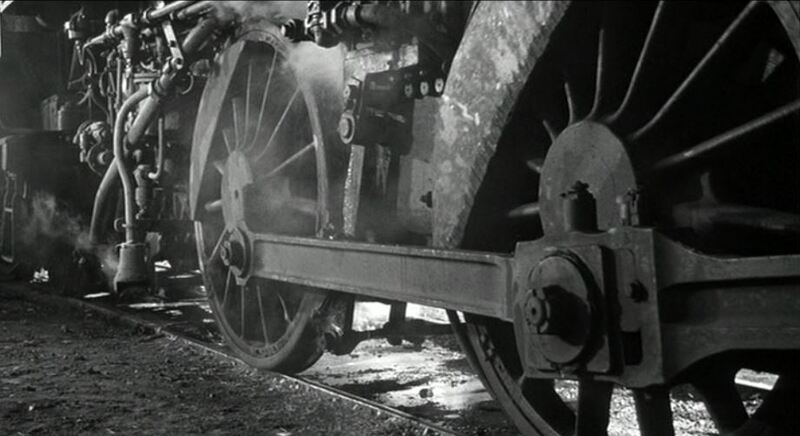 Detail shot of the little 2-6-0’s drivers. Look at all that hardware! 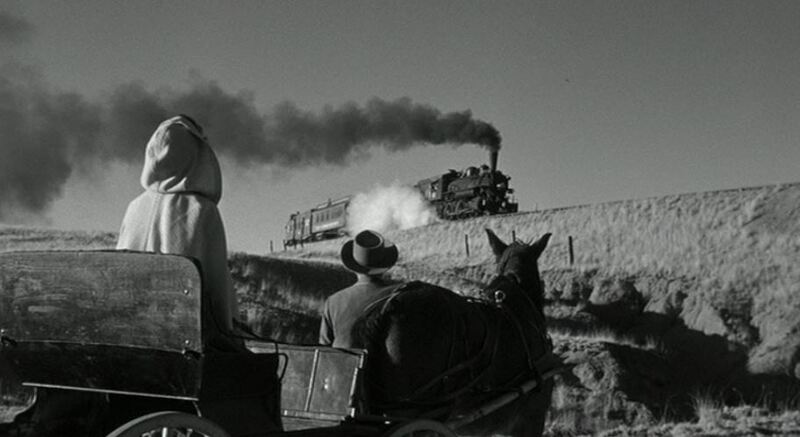 ; The confrontation as the train starts to pull out. 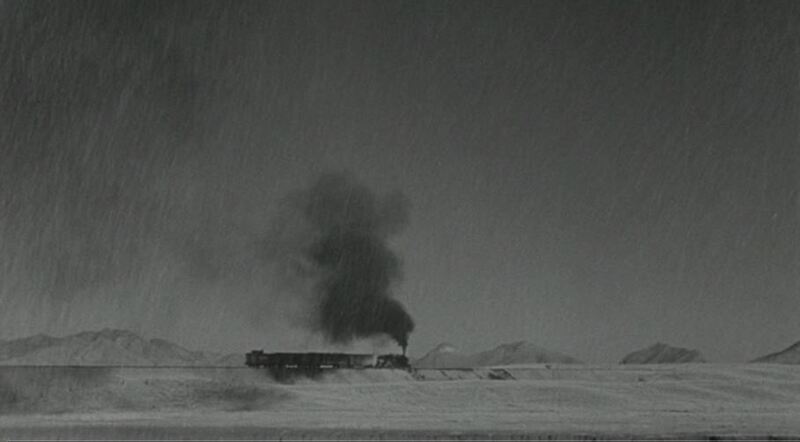 There’s the baggage car they must get on — door conveniently left open. 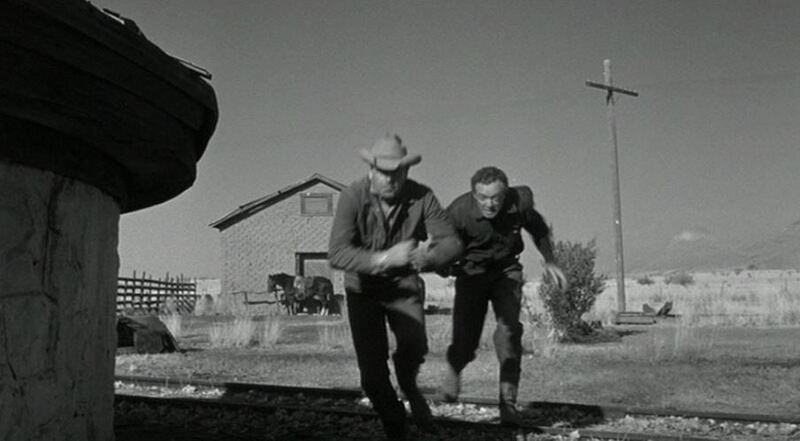 Also a good view of a very SP-looking wood caboose with its distinctive cupola; In a perfectly timed leap, Van Heflin hoists Glenn Ford and himself up into the baggage car. The gang is still in hot pursuit. 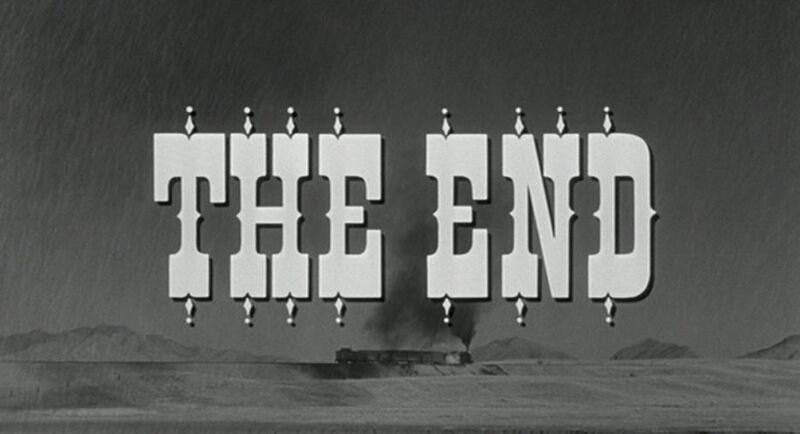 Evans dispatches Prince with his six-shooter and the outlaws fall back in confusion and disarray. 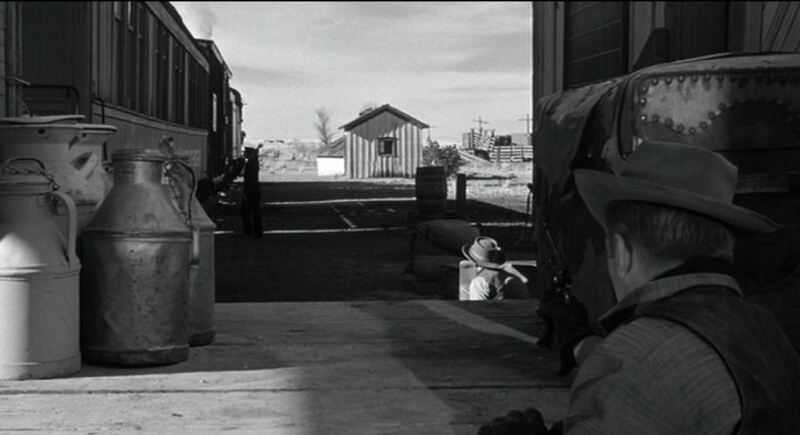 Evans’ wife Alice (played by Leora Dana) is waiting trackside as the mixed train rolls off with her very much alive husband in plain sight. 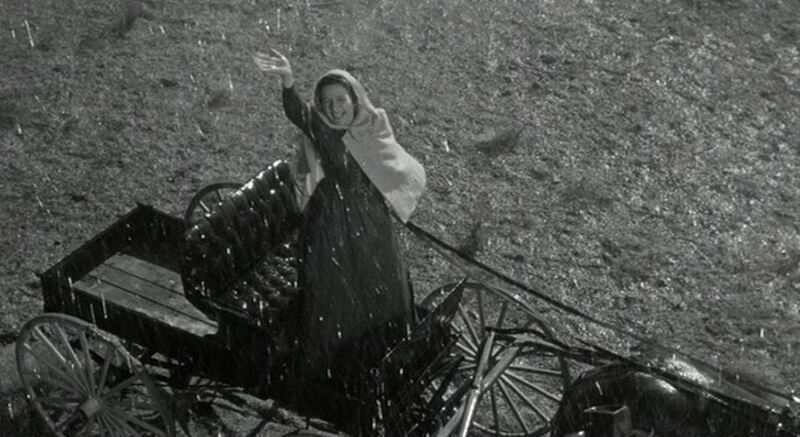 When it rains, it pours (drought had been the recurring theme throughout this picture). The crops are saved! Extra 62 West heads through the rain towards justice as the credits roll. 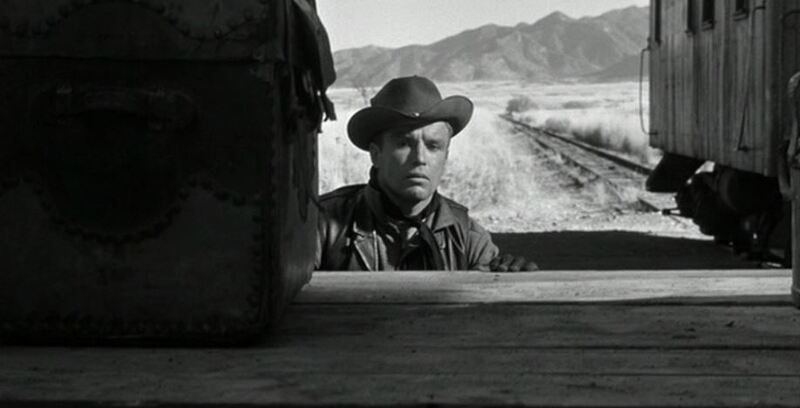 The movie itself is pretty good – sort of a “psychological Western” as was popular at the time. 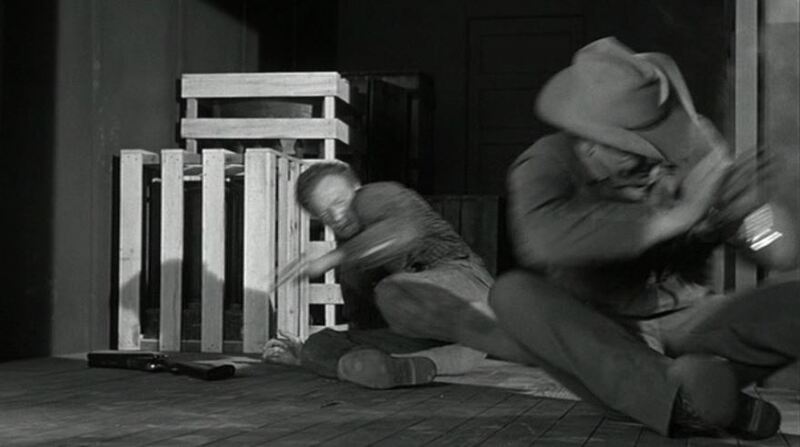 Glenn Ford particularly got to play against type as the charming but deadly bad guy. 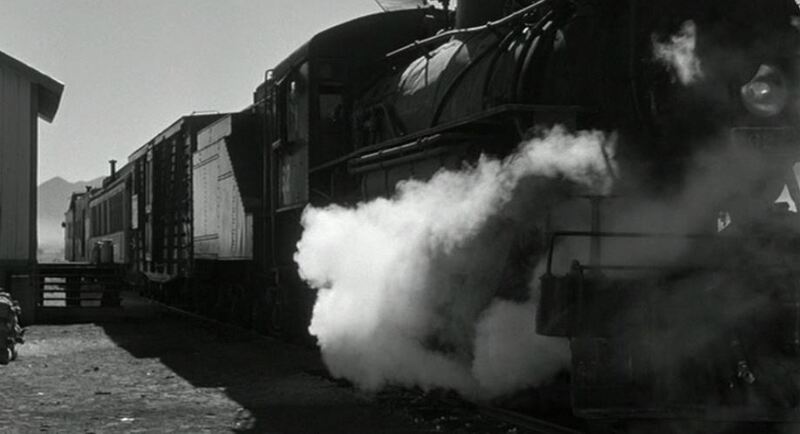 Southern Pacific put together a very appropriate consist — mostly wooden cars — pulled by the most common locomotive (M class, 2-6-0) the railroad owned (355 units built between 1899 and 1923). 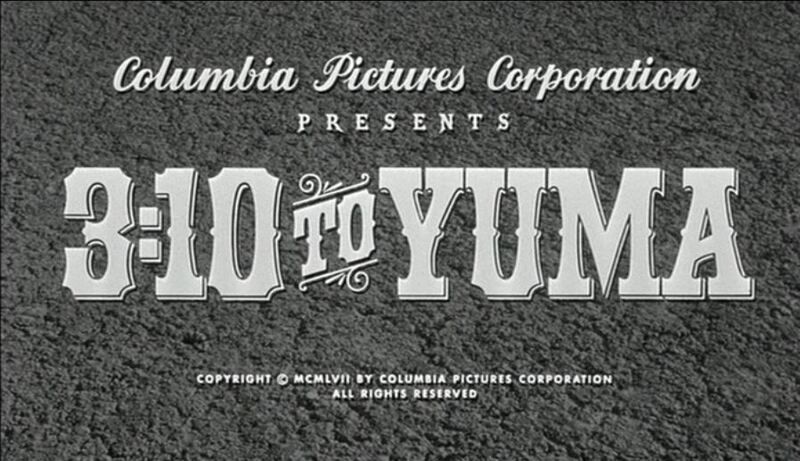 This entry was posted in Uncategorized and tagged 3:10 to Yuma, Arizona, Class M-4 2-6-0, Columbia Pictures, Elgin Arizona, Espee, Glenn Ford, Leora Dana, Patagonia branch, Richard Jaeckel, Southern Pacific Railroad, Van Heflin, Western, Yuma and Benson Southern Railroad. Bookmark the permalink.